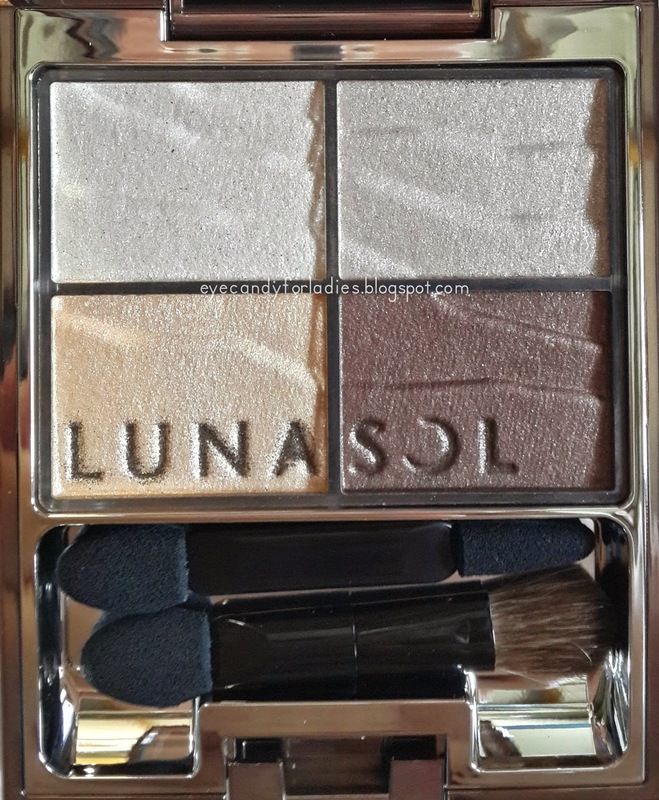 LUNASOL, Kanebo's high-end brand that emphasizes on the balance of utilizing decorative make-up for "Refined Women"
Derived from Luna (Moon), and Sol (Sun), LUNASOL believes that "putting up make up every morning can be regarded as a ritual designed to bring out your refinement." Can't agree more. - Last but not least, a well-purified skin. 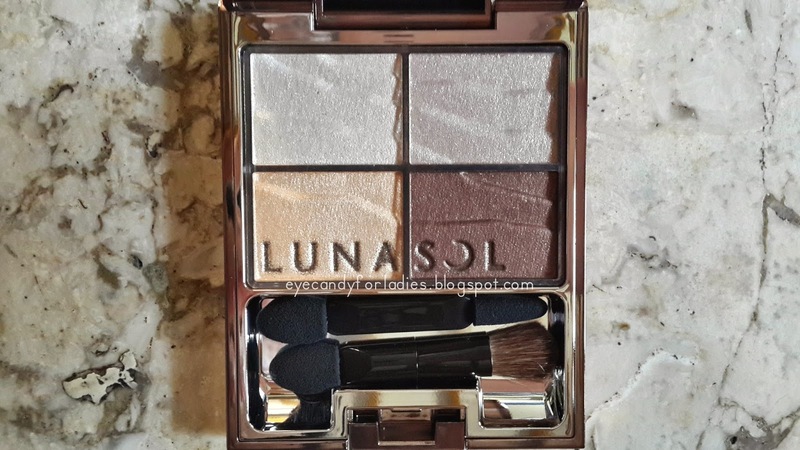 However, the product I will be reviewed here is a set of X-Mas gift from my ex-employer consisting of Nature Color Eyes in BR-03 alongside with Full Glamor Lips in 08 Soft Red Rose but I will go down with the eyeshadow product first. 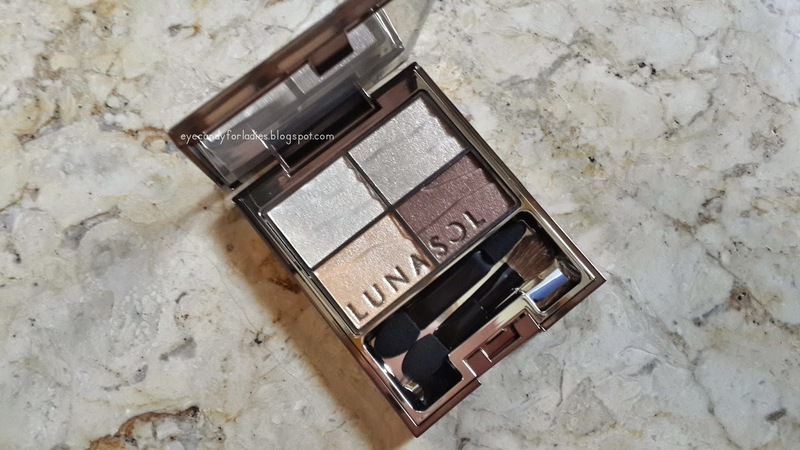 A four-color eye shadow set that captures the most beautiful scenery of the Earth in a simple palette. 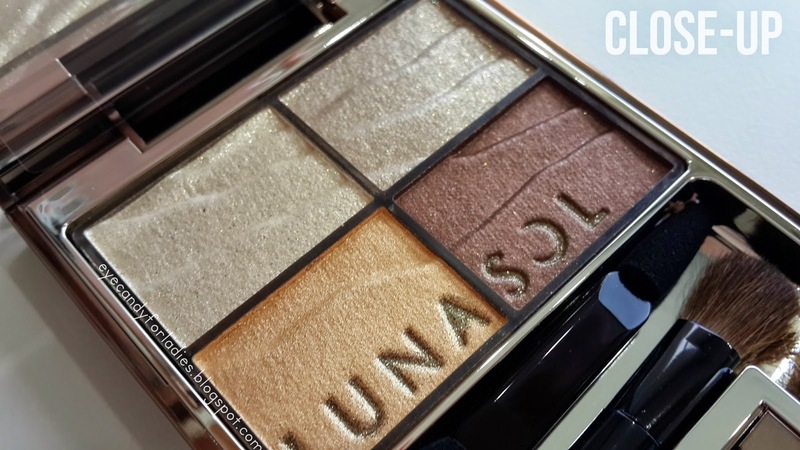 "Nature Color Highlight," a highlight color in a new formulation, adds a succulent radiance and clarity to the eyes. The layering of color produces an amazing gradation of tones with a moist luster. The colors stay clear forever, with a deep nuance to please the eye. With 2 available shades in bright and playful color displayed in the official website, this BR-03 is strikingly different with more subtle and demure shade of Brown. 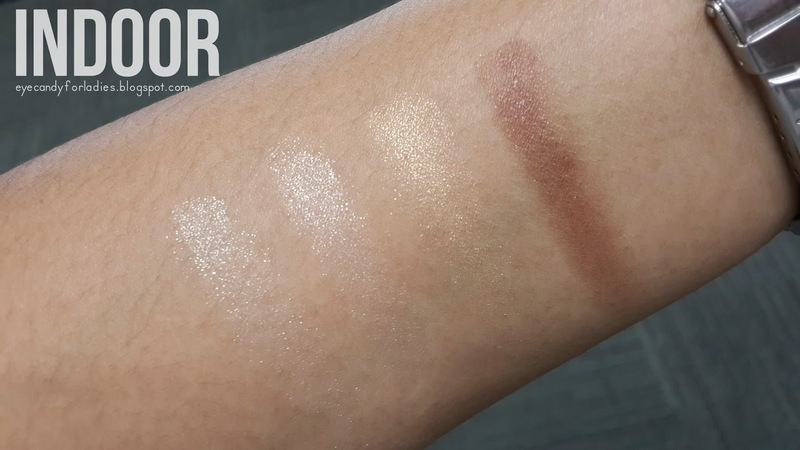 Unfortunately, BR-03 is a discontinued shade from their 2010 series which promotes "Purifying Makeup created with crystal clear colors and succulent sparkle." 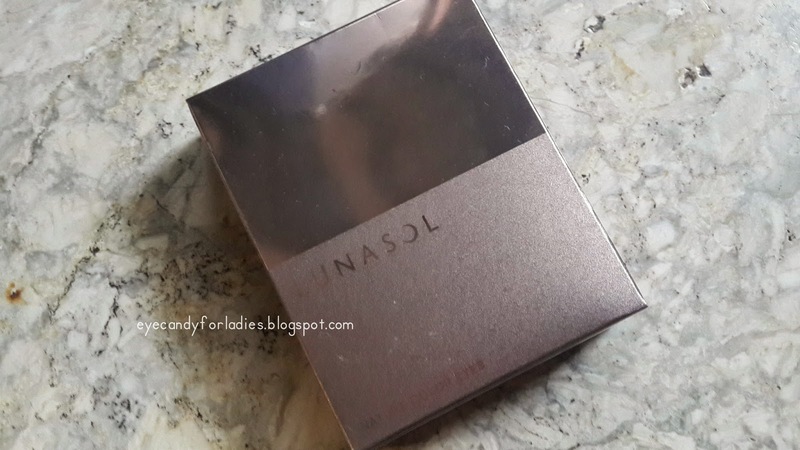 Lunasol Japan retailed it for Yen 5.000 exclude tax and weight for 6.5 gr made in Japan. 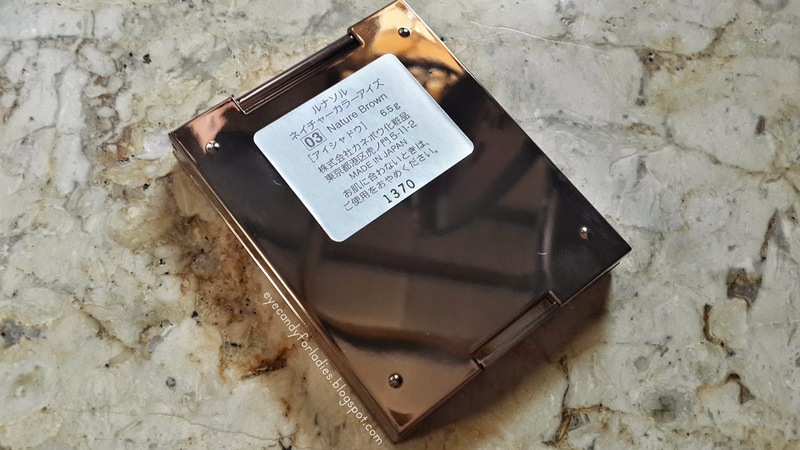 The information both in the box and the case is written in Japanese with limited info imprinted in English, but you can check further info about the product in their english version website. Funnily, Lunasol Indonesia labeled it for IDR 540.000 nett and still display the BR series in their counter. It's a bit strange when the outer countries official website doesn't display BR series anymore while Indonesia still kept it in on-the-market, I can assume that's how the marketing works.You can Lunasol make collection here. 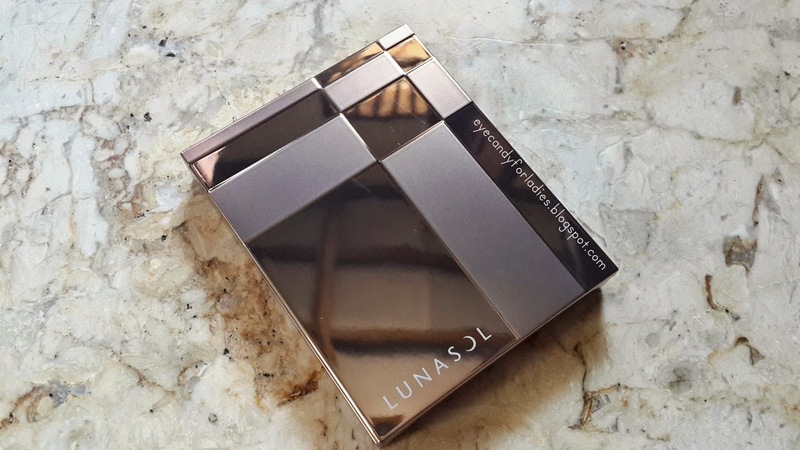 Representing premium-brand concept, Lunasol range comes in an elegant rose-gold metallic case with a minimalist Lunasol logo embedded in it. 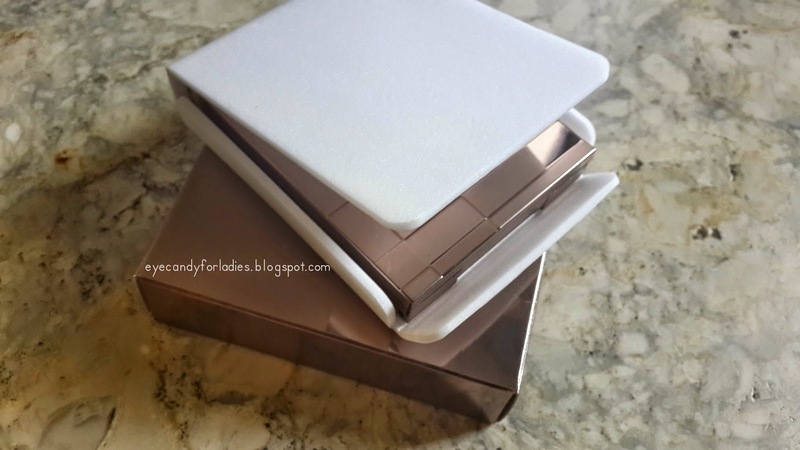 Photos array above showing the outer packaging of the product whereas the vast array below showing the luminosity of the case and the product. 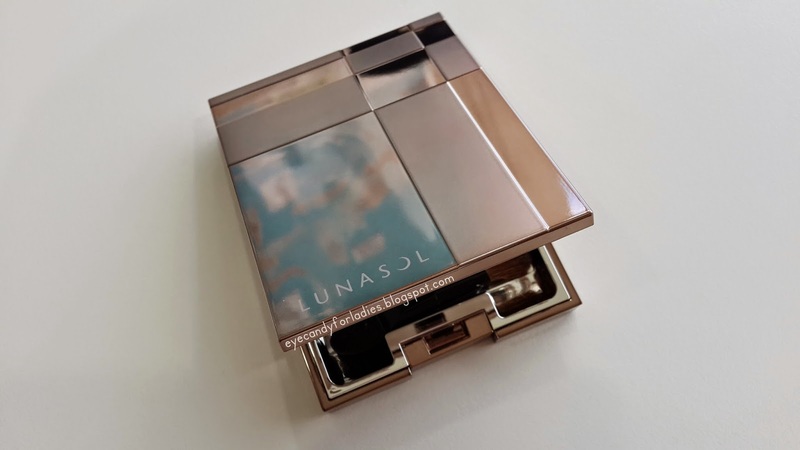 Comes in an alluring intense rose-gold metallic packaging in a solid metal case, Lunasol's typical packaging defines minimalist yet sophisticated concept without overly dull. 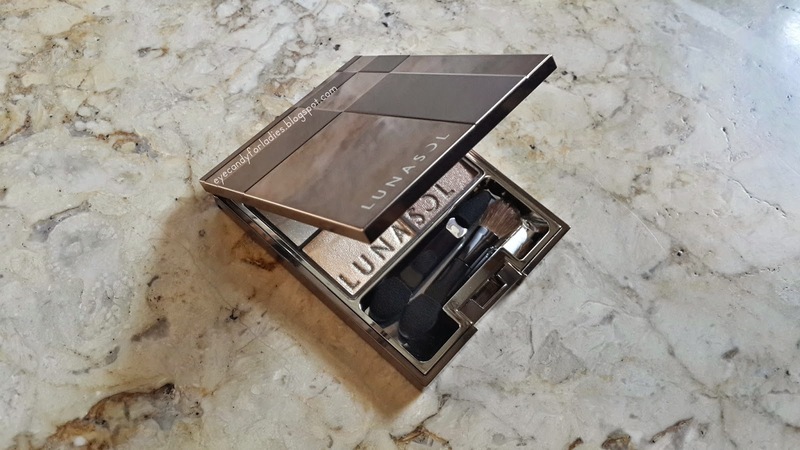 This quarter eye shadow compact equipped with an attached mirror and double-end sponge & brush tip for easier application. 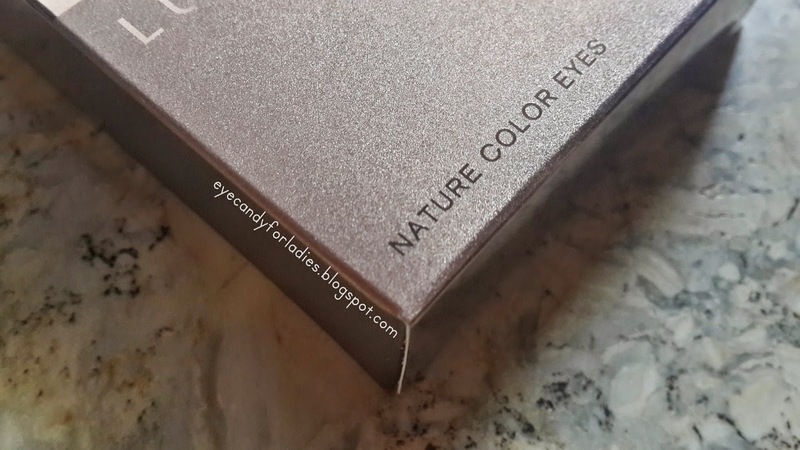 Nature Color Eyes has subtle pearly/iridescence particle over the pressed powder; even you can see it with your naked eyes. The finish & texture is more likely to "Majolica Majorca Jeweling Eyes" but more subtle whilst the nuance creates soft focus of shimmering effect on your lids. 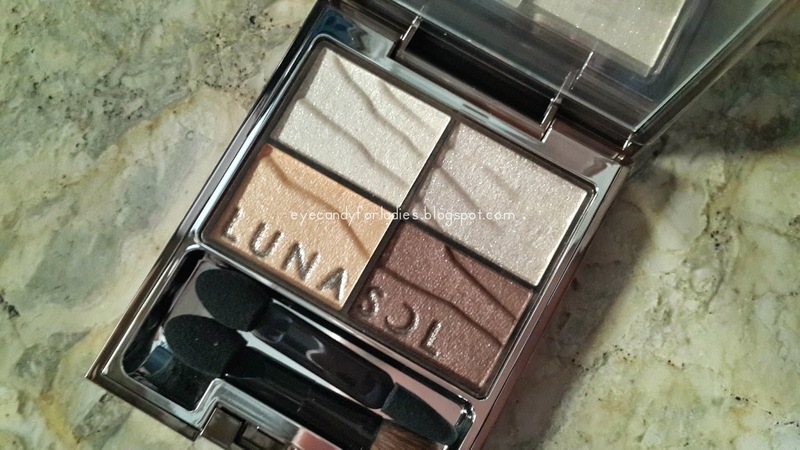 Its a lil' bit chalky due to its tinge glitter particle yet still deliver good amount of color. BR-03 is warm brown-based shade in a pressed-powdery texture. 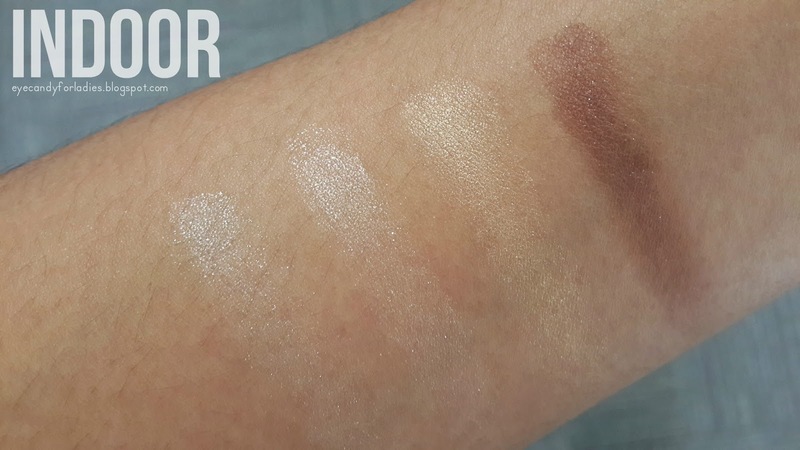 From upper-left clockwise is a champagne-beige shade, moving to the right is in the similar spectrum of beige but more brownish. 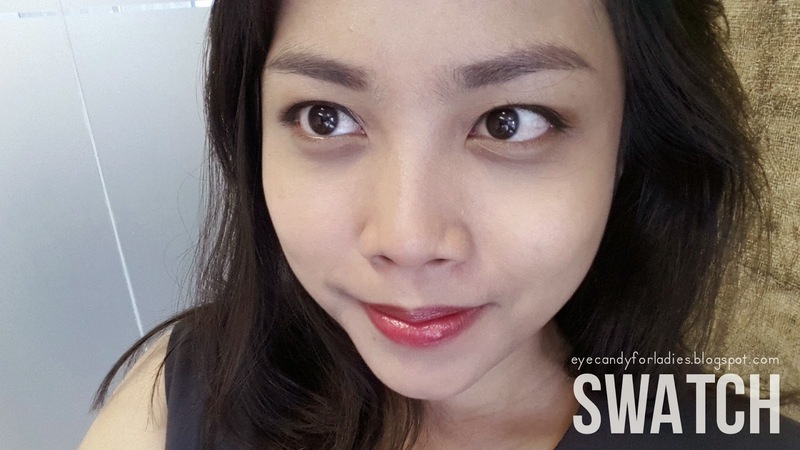 In the lower right has brown shade as liner/contouring color and finally yellow-orange color as the highlight color. 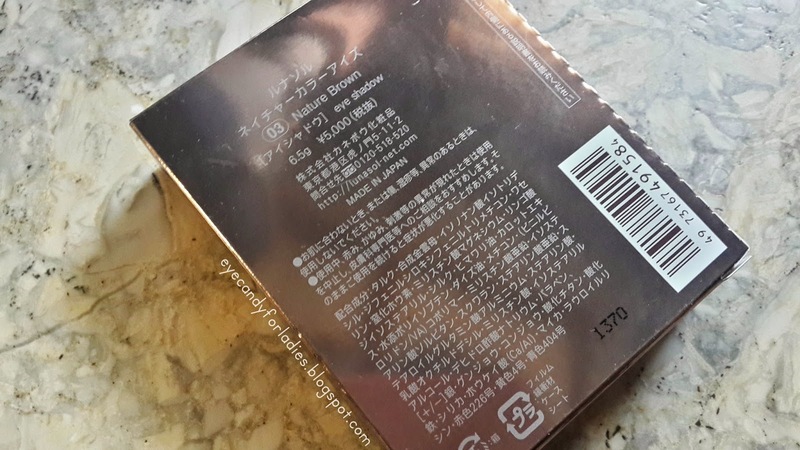 As I said before, the powder has noticeable tinge glitter substance but still delivers good amount of color. 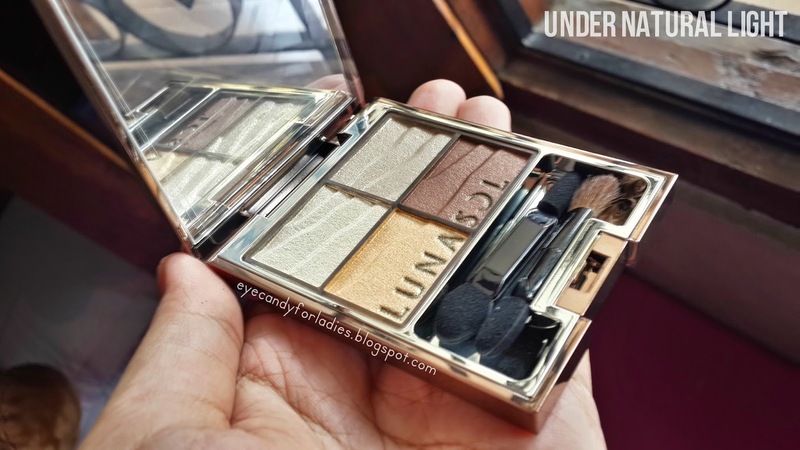 It's not too sheer yet not too pigmented. 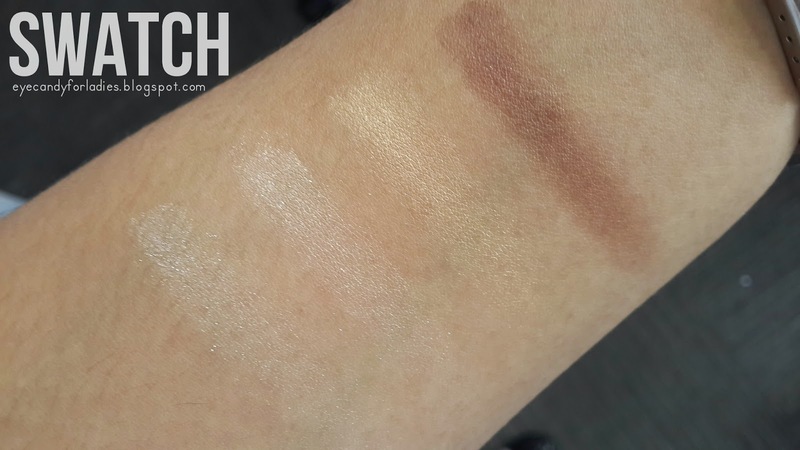 The powder transfers hint of color yet (to be honest) it's not that build-able kind of product. Leaving a minimal amount of fall-out due to its chalky-powdery & glittery texture but the good thing it's fragrance free. 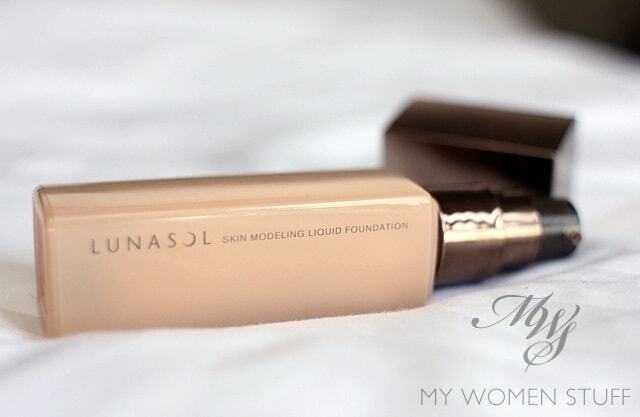 Long-lasting and stays for about 4 hours more, however, to get its true color you might need a primer instead. 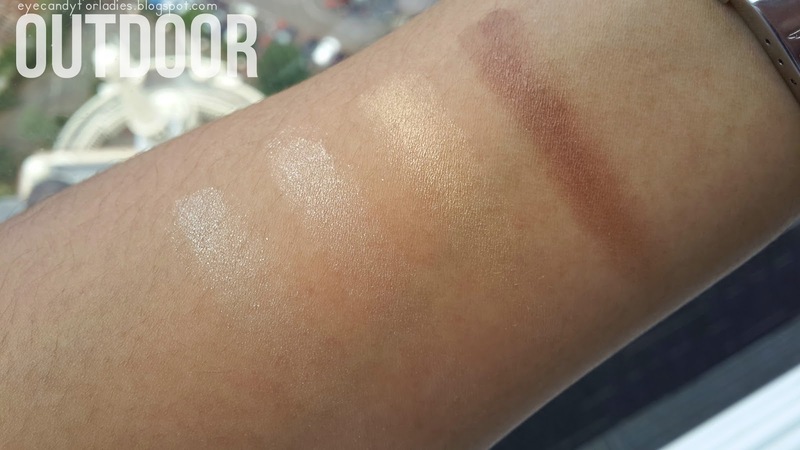 For comparison from the first line-up photos above, the color in the pan comes out strikingly vibrant. The tinge glitter is noticeable and the bling isn't that much sparkle. 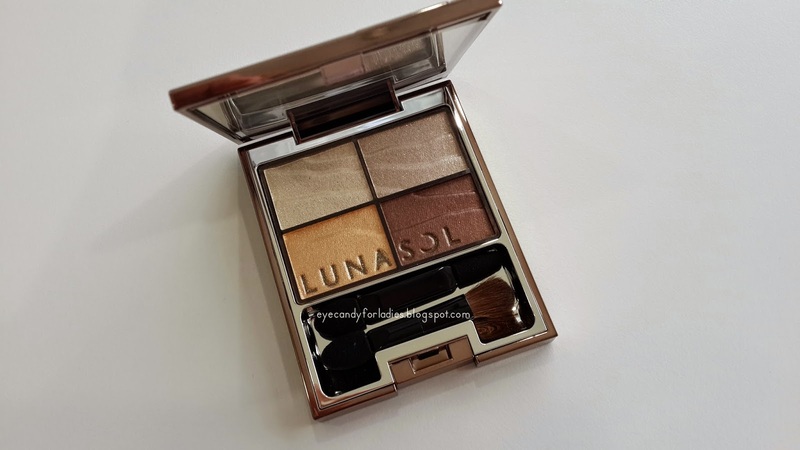 I'm head over heel with Lunasol eyeshadow range! 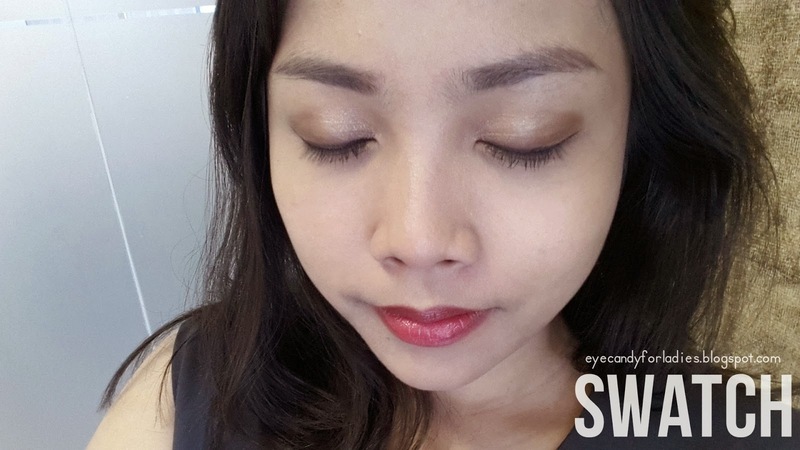 The subtle tinge-shimmery powder is not overly striking your eyes when it's blended onto the lid. 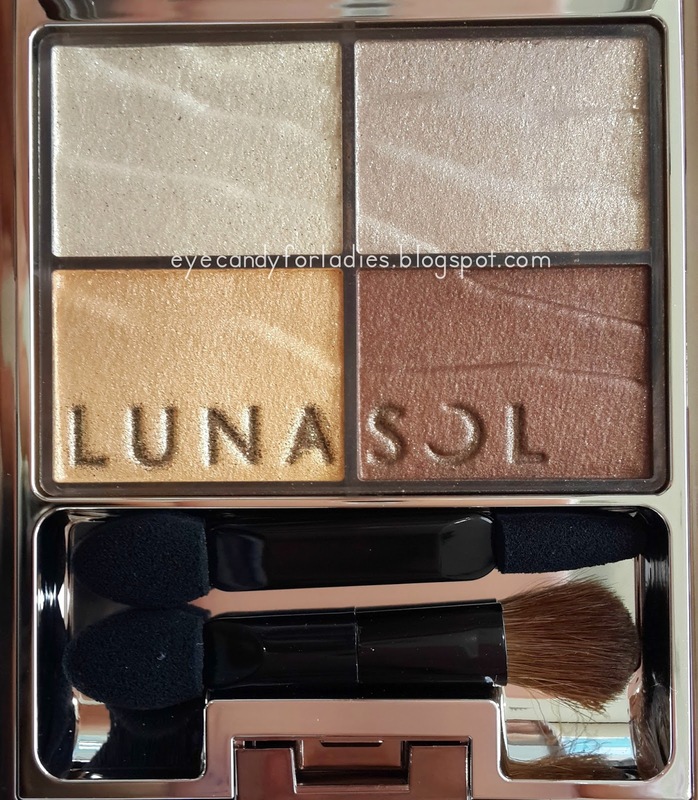 The Lunasol Nature Color Eyes is (imho) just like typical Japanese eyeshadow product; subtle shimmery whilst delivers demure amount of pigment into the lid. 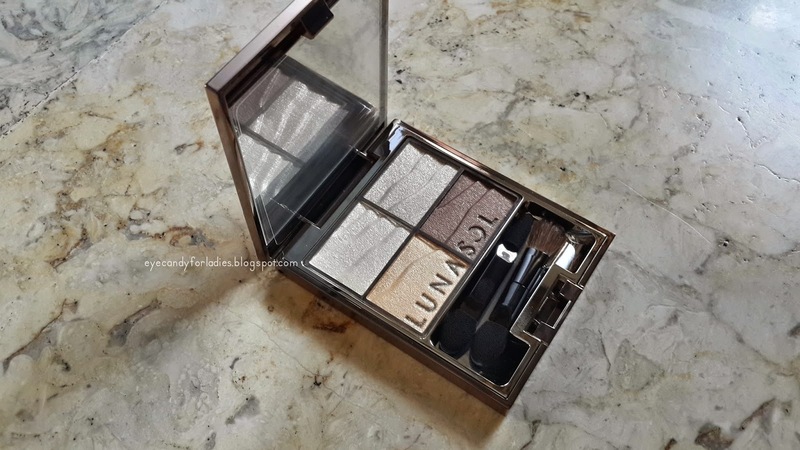 I usually put it as my go-to-product for special occasion because the tinge shimmer reflects a beautiful and subtle sparks of color. 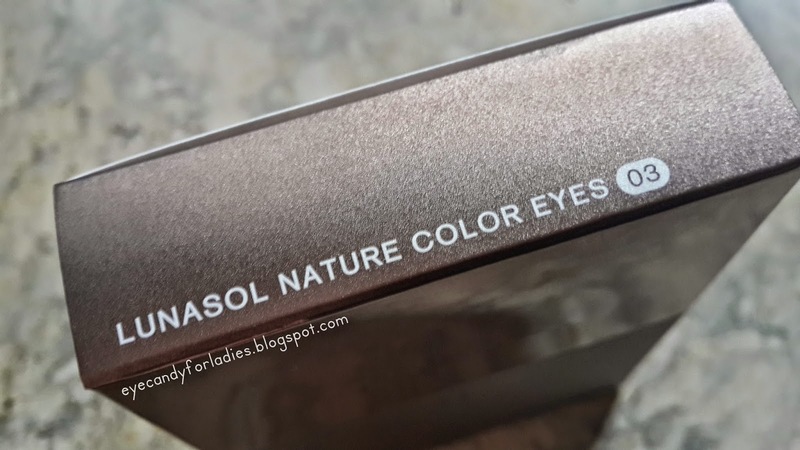 However, this range is less popular comparing to the prominent Skin Modelling Eyes in Beige Beige which is renown for its "versatile looking without trying too much" finish. 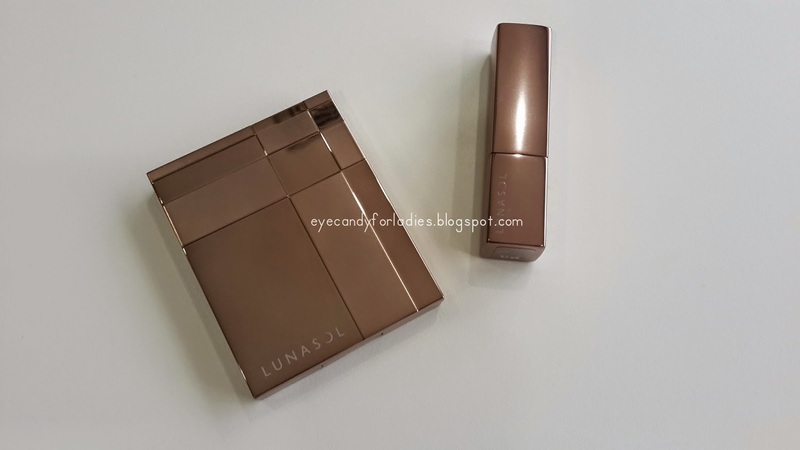 Too bad Lunasol Indonesia doesn't have one when I came there :( The only thing I'm still consider from this product is the retailed price which is quite costly, but hey, you get what you pay. 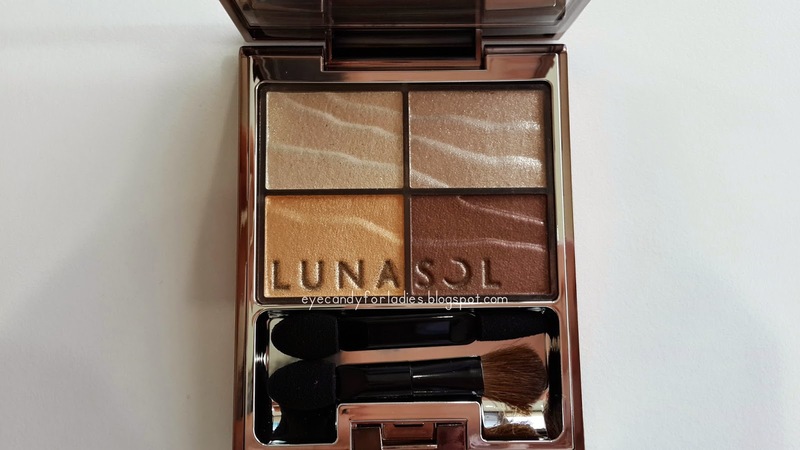 For further reference, you can read the other shade of Lunasol Nature Eyes Color in 05 or for comparison you can check Lunasol Three-Dimensional Eyes in Natural Beige.